After all the codes are inserted in the main document, it’s time to perform the merge. 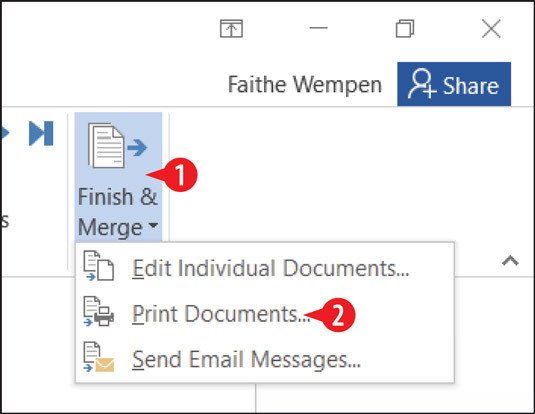 There are three ways to go about this in Word 2016: you can merge to a new document, and then print that document as a separate step after examining the merge results, you can merge directly to your printer, or you can send email messages. Which is better? It depends. How sure are you that you’ve set up the merge correctly? 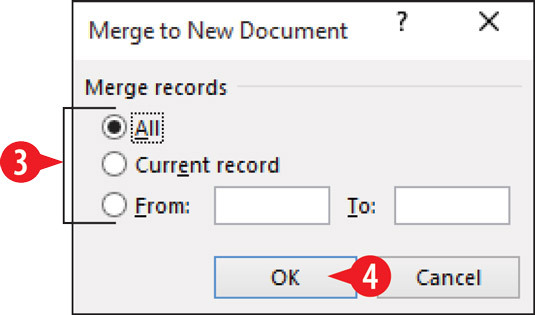 You should merge to a new document the first time you run a new merge to make sure that it works the way you intended. But if you are running the same merge repeatedly (such as sending out the same form letters every month to the same people), it’s fine to merge directly to the printer. 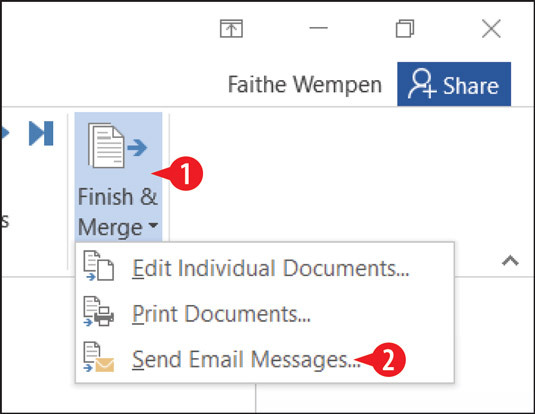 You can preview the merge results without having to create a whole new document. Just choose Mailings→Preview Results. Then use the arrow buttons in the Preview Results group to move between results pages. On the Mailings tab, click Finish & Merge. A menu opens. 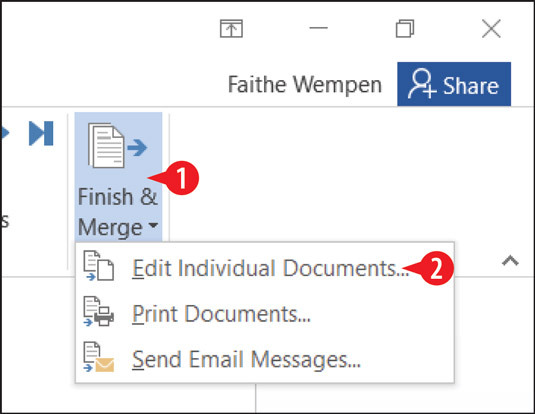 Choose to edit individual documents. (Optional) If you want to include only a certain range of records, specify that range. Otherwise leave All selected. Click OK. The new document is created. Choose a range of records. Print and save the new document as you would any document, and then close it. Save your merge main document for later reuse if desired. 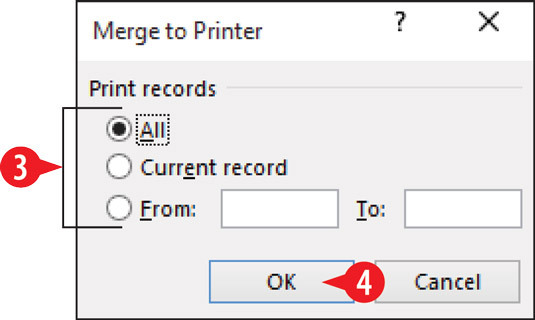 Choose to merge to a printer. 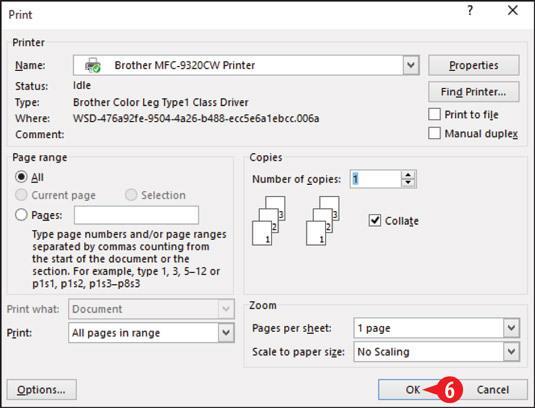 In the Print dialog box, specify any print options as needed. Choose printing options and complete the printing. 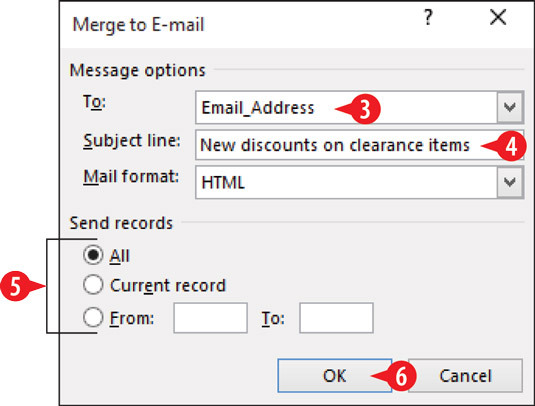 Open the To: drop-down list and select the field that contains the recipients’ email addresses. This field might or might not have been inserted in the message. In the Subject line box, type the desired message subject. Click OK. The messages are sent using your default email application (probably Microsoft Outlook).